Brockville was first settled in the spring of 1785 with the arrival of former ensign William Buell, a 33-year-old veteran of the British-American War of 1776-1783. For his service in one of the British militia units, and as a United Empire Loyalist, Buell had received a grant of land. After selling a number of town lots to new arrivals, Buell was able to lay out a town plan by 1802. Soon there were a number of buildings erected here using stone from local quarries. 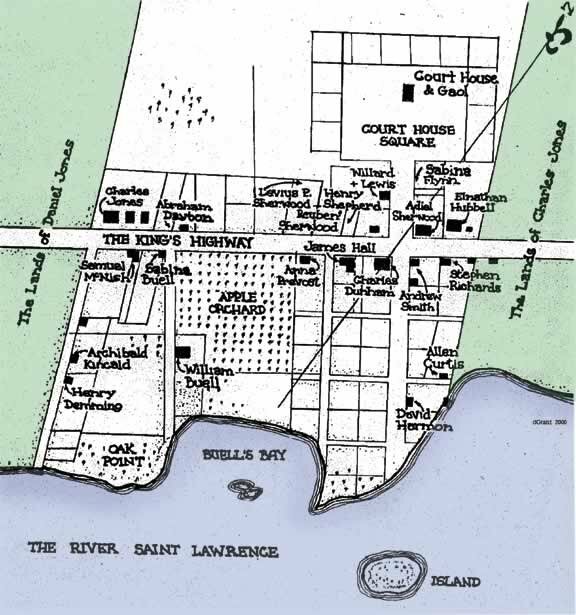 The new settlement may have been known as “Buell’s Bay” by some in those early days. The government of Upper Canada recognized the important location of this small village in 1808, when they authorized the building of a district court house and gaol and established the administration of local government here for the District of Johnstown. The new Court House was opened in 1810 and the surrounding open space was developed into what is presently Brockville’s Court House Green, one of the finest urban spaces in Canada. A new town plan was published in 1811 which showed 26 buildings and a growing population. By that time the government was using the official name of “Elizabethtown” to refer to this village. The first resident clergyman, the Rev. William Smart, arrived in 1811, and proceeded to establish a congregation of the Presbyterian Church. William Buell gave the land for a new church which was built shortly after on a site just west of the Court House. 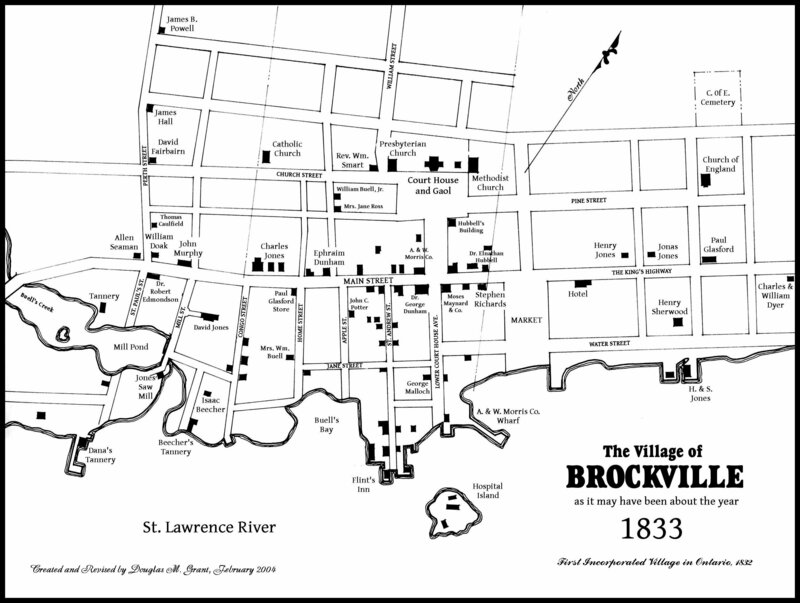 The village of Elizabethtown was renamed “Brockville” in the summer of 1812 in honour of General Isaac Brock, who was the military and political leader in the first year of the War of 1812-14, until his tragic death on October 1812 at the Battle of Queenston Heights. By 1830, Brockville was one of the few villages in the province that sent its own parliamentary representative to the Upper Canada Legislature. 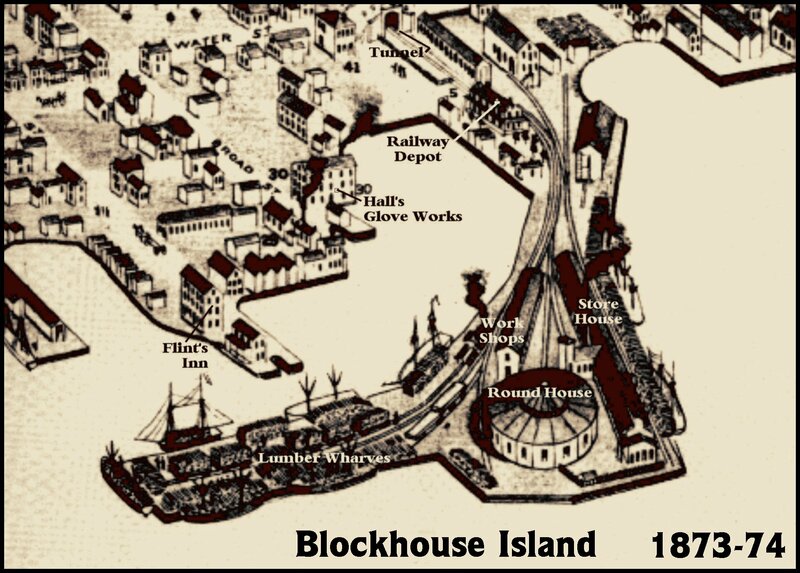 Soon after, it was the first community to be granted self-government with the passing of the Brockville Bill in 1832. ‘Isaac Brock’s Town” was the first to be allowed to elect village councillors, pass local ordinances, and raise money for local improvements by taxing its residents. A visit to our small city on the St. Lawrence will lead to a discovery of the first Railway Tunnel built in Canada (1860). This tunnel runs under the city itself for a distance of one-third of a mile. Outside of town is one of the most significant garden cemeteries, the Brockville Cemetery, dating back to 1851. River travel was, from the first, important to communications and at one time, eight passenger steamers touched at the Brockville waterfront every day. The Grand Trunk Railway began operations by opening travel to Brockville from Montreal in 1855. This is where “The Past is still Present“.